Hungarian goulash can be neither a soup or a stew, or it's somewhere in between. Authentic traditional Hungarian goulash, easy to make and packed full of flavor! 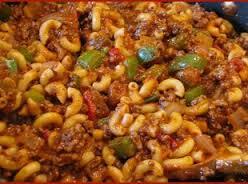 Authentic Goulash is a beef dish cooked with onions, Hungarian paprika spice, tomatoes and some green pepper. 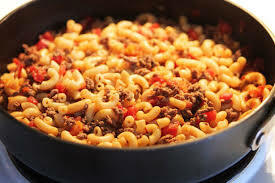 This recipe below is really more of an American Goulash ,but its really just as tasty! Brown ground beef until done. Meanwhile, dice onion and green pepper. Add onions, green pepper, tomatoes, tomato juice, and macaroni. Salt and pepper to taste. Cook on medium low heat for 45 minutes. Serve with a sprinkling of Parmesan.